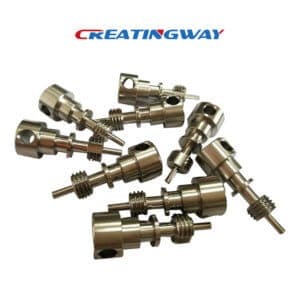 As a CNC Machined Parts Manufacturer, Creatingway provide you more CNC Machined Parts design, machining, inspection and packaging a series of services. Our precision machining services including Milling & Turning machined, Lathe machined Parts, welding, finishing services, Creatingway always are devoted to make each of projects satisfying to our global customers and business partner. Our engineer team with using high precision CNC machine ( TaiQun Brand) to meet your parts tolerance and specification, we always strictly control parts tolerance within +/-0.002-0.003mm if the customers do not special indicate area, and make sure parts surface finishing within 16 level polishing. Our production team will be closely schedule every new production orders in shorten delivery time, we will produce and ship the goods in 7 working days for 1-500pc if the parts materials is existing from marketing. We will pack each of parts separately with film and bubble bag into five layer K=K carton packaging. Our engineer team own more machining filed of professional experience, provide reasonable and convenient process to your projects, make one-step service to your projects from design analysis, machining process, cost control till production inspection and packaging as well as shipments. Creatingway provide you our CNC machined Parts ranges from automotive parts, medical device parts, LED heat sink device, auto machinery components, Oil&Gas components, hardware spare parts etc, we offers you competitive price and 100% premium quality. Express: DHL, UPS, Fedex, TNT etc. Ocean: FOB, CIF, DDU etc. Why Does Aluminum Alloy Casting Need Heat Treatment?